Rebecca Drolen (b. 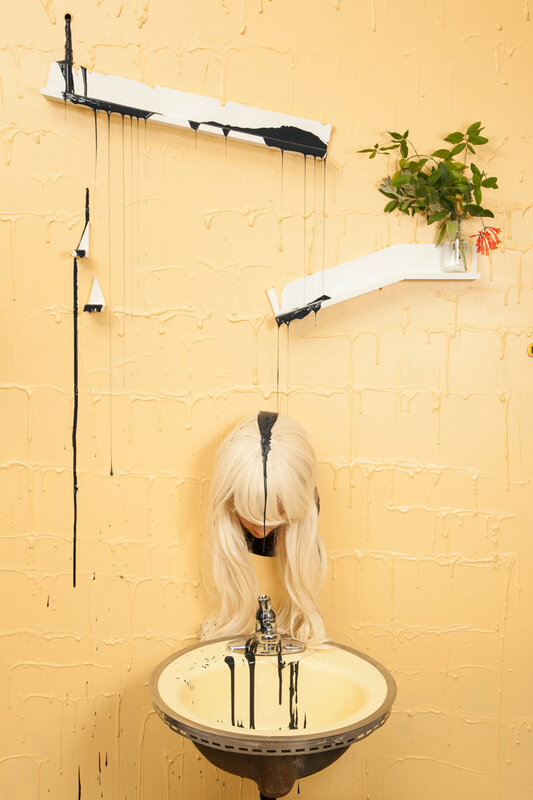 1983 in Northwest Indiana) is an artist and educator currently working in Arkansas. 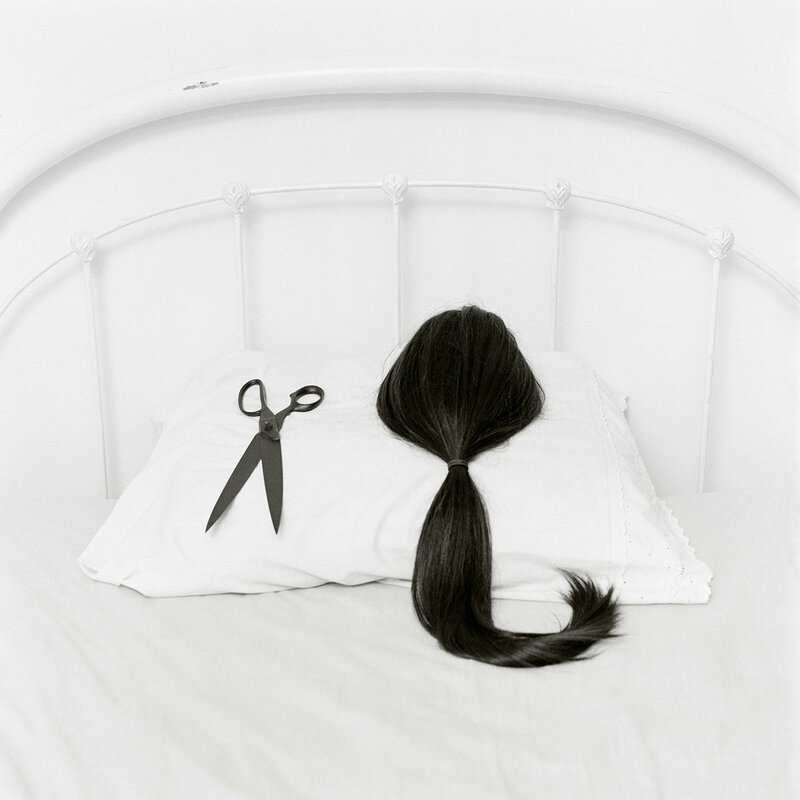 Her photographs are concerned with how individuals visually assemble their identity – and she is particularly preoccupied with hair. The work balances building spaces, assemblage, and performance, but the end result is persistently the photograph. Drolen’s work has been shown in group and solo exhibitions on a national and international level, within noteworthy venues such as the Huffington Post, Oxford American’s “Eyes on the South,” the Houston Center for Contemporary Craft, Texas Tech University, The Oklahoma State Musueum of Art, CICA Museum in Gimpo, Korea, and the Theory of Clouds Gallery in Kobe, Japan. Drolen has had work published in various art magazines and blogs and has photographs held in private collections as well as the permanent collection at McNeese State University in Lake Charles, Louisiana. Drolen received her MFA in Photography in 2009 from Indiana University. She has been teaching at the University of Arkansas for three years as a Visiting Assistant Professor, and is currently serving as the Area Head of Photography while transitioning to a permanent position in the School of Art. 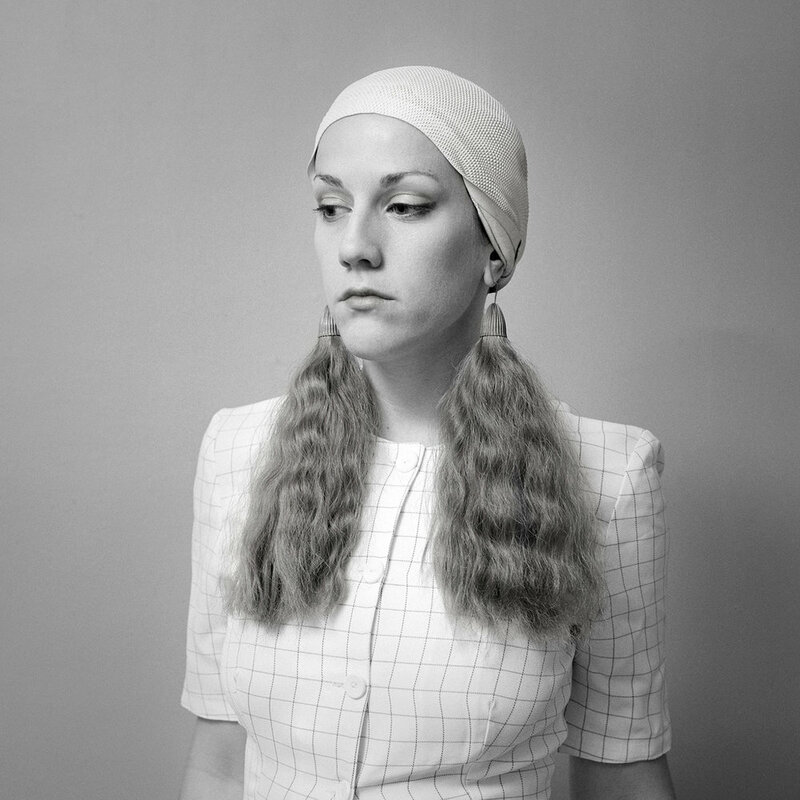 Hair Pieces explores the fickle relationship most have with their body hair. We consider some hair very desirable and grow and groom it with care, while we treat other hair as shameful and cover or remove it. 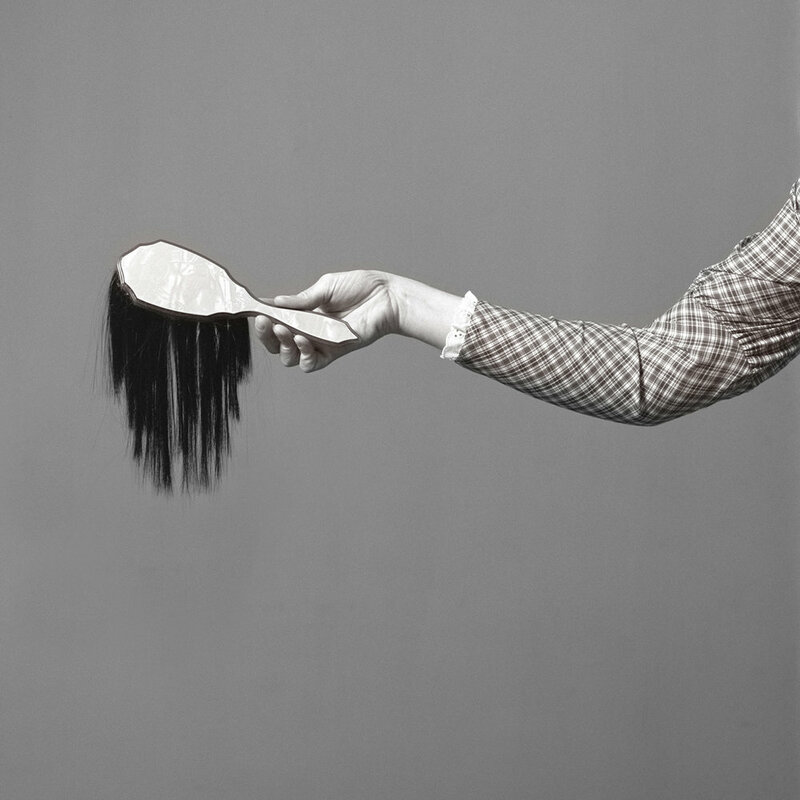 Once hair has become disconnected from our bodies, we treat it with disgust, yet it has an archival, lasting presence that outlives the body and defies death and decay. I am interested in the line between the beautiful and the grotesque in our connection with hair. I am intrigued by the rules that guide our ideas and self-image in relation to our tresses. In the work, I use photography and the self-portrait as a medium to construct narratives that function both as visual puns and, at times, as social critique. I hope to use the beautiful alongside the repulsive in these images to tell stories of growth and removal as they examine a surreal relationship between hair and its place. The newer color work is a natural extension of these ideas, but specifically looks at the body and hair as a source of protection. In the images, I depict a factory-like setting in which hair, nails, and teeth are added to the body, rather than removed. The figures are building their defenses. The project began in response to the 2016 election. It was a time when many stood in awe that the country would affirm to the highest office a person who bragged about feeling powerful enough to sexually assault women and regularly publicly praised or shamed women based on their appearance. An older Internet meme informed my starting ground. It depicted women’s nylons that looked like hairy legs. In presumed jest, they marketed themselves as a means to “Discourage any potential perverts,” with added description, “Once the guys lay eyes on your shapely and excessively hairy stems, they won’t even bother giving you a second glance – unless they’re into that sort of thing.” The troubling narrative that women’s body hair is repulsive, unless fetishized, is a truly peculiar example of my social and feminist concerns as an artist. The treatment of materials and textures make reference to older spaces that have a history of repeated, heavy usage. Narratives are digitally stitched together as one gesture connects across time to another, and the playfulness of animated gifs embrace the absurdity within these scenes. Much like a shaved animal would be vulnerable in the wild, I attempt to humorously consider how the body itself can be increased as a means of protection within a society obsessed with hairless women. It is an exciting time for the University of Arkansas. This year, we officially transitioned to being a School of Art with the support of two monumental endowment gifts from the Walton Family Foundation as well as the Windgate Foundation. Our community will be changing quickly with plans for growth, building new facilities, and unprecedented student support in the form of scholarships and travel opportunities. Our MFA students in photography are all fully funded with Graduate Assistantships and additional Fellowship funding to support their creative research. 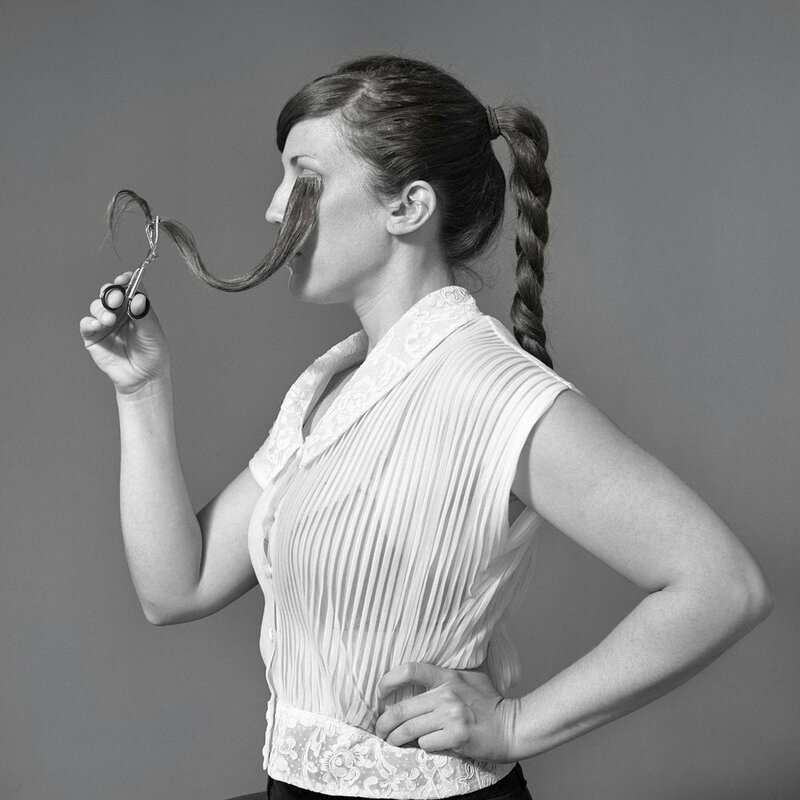 We offer BA, BFA, and MFA degrees in studio art with an emphasis on Photography. We house Post-Bac students intermittently and provide mentorship and facilities to help them prepare for a graduate program. Our program encourages interdisciplinary study and seeks means of expanding the definition of the photograph in contemporary art through experimentation with the many tools of the medium. With our placement in the J. William Fulbright College of Arts and Sciences, cross-disciplinary study is accessible and encouraged within the larger university. Our current facilities include two traditional darkrooms, alternative processes facilities, a digital print lab, a lighting studio, and MFA studios. We look forward to growing our lab spaces in the next three years. University of Arkansas is located in Northwest Arkansas (Fayetteville to be exact). It not only offers a beautiful landscape within the Ozarks, but also an enthusiastic, active, and engaged art community. Exhibition spaces range from small, student-run galleries to the inimitable Crystal Bridges of Museum of American Art. Between the School of Art’s active visiting artist program and Crystal Bridges commitment to bring artist and historians to the region, the access to important contemporary voices in the art world is unexpected and profound. I teach at all levels within the program – from our introductory course to upper level BFAs and close mentorship of graduate students. I most frequently teach Digital Photography, Photo I (darkroom), MFA Photography Seminar, and Undergraduate Professional Development. I recently designed and taught a course exploring the Constructed Image, which considered fabrication, installation, and digital manipulation within contemporary photographic practice. Next Fall I eagerly await teaching students the many splendors (and frequent frustrations) of the View Camera. Our program is enthusiastic about the many approaches, materials, and processes that accumulate to build the contemporary idea of a photograph. We use film both in the beginning black and white darkroom course, and also later as students explore large and medium format cameras. We house two JOBO processors to allow students to learn the process of developing their own color film (as many photo labs close throughout the country). Alternative Processes is a rotating course, but we maintain chemicals and facilities for upper level undergrad and graduate use. Digital Photography is critical within our program (because we also see it critical to art making!) We offer Digital Photography as a stand-alone course and digital techniques are built into every upper level course – ranging from full digital capture to scanning film and outputting as inkjet. We plan to add Video and time-based work to the curriculum in the next couple of years, as well as an Advanced Digital Processing course. We output photographs in many ways and embrace how the character of the output is intimately tied to the artist’s intent, content, and ideas. While the practice of making fine prints is most often critical in our beginning and intermediate level courses, at the advanced level, there is greater room to explore the screen as the ideal end result of the image. We have facilities to make traditional black and white silver prints of considerable scale. We house Epson inkjet printers up to 44” in width. Many of our graduate students explore installation and the sculptural potential of works on paper. We encourage experimentation with output and embrace a broad view of the idea of a photograph. In undergraduate courses, critiques happen in class as a culmination of specific assignments. I see critique both as a time to build understanding of how we read images and build vocabulary on how we speak about images. I hope to help students recognize the differences between their intentions in making and how an image is read without their explanation. I frequently try new critique methods to get students engaged in speaking, writing, and finding the best questions for their work that drive them to their next steps in making. I firmly believe that the answer to your next work lies within understanding what you have already made; one movement leads to the next. We have graduate critiques within the Photo area during Grad Photo Seminar. Visitors are always welcomed and often invited by students. Graduate students also have Midterm and Final critiques each semester of their first two years with faculty from the entire School of Art (Studio, Graphic Design, Art History, and Art Education faculty all participate). This interdisciplinary critique format allows cross-pollination in all media areas. Faculty are often deeply invested in graduate students outside of their medium and will do studio visits outside of the midterm and final critique system. We have a very active Visiting Artist program with new artists lecturing nearly every week. Grads are frequently offered opportunities to have studio visits with visiting artists and are encouraged to seek out new voices and perspectives on their work.